This Side Walk Sign Features A Snap Open Frame For Quick & Easy Graphic Changes! 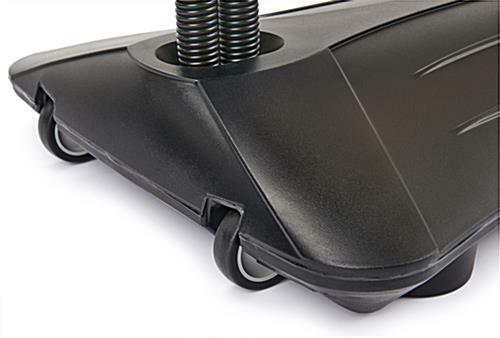 Black plastic fillable water base & spring connectors ensure stability in inclement weather! 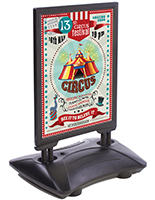 Black polished snap open frame makes changing graphics quick & easy! Wheels and handle make this side walk sign easily portable! 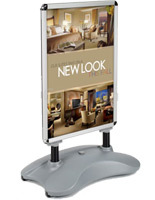 Aluminum snap frames accommodate 30" x 40" posters. A side walk sign is a great way to advertise to passing customers. 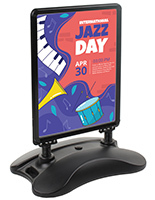 A portable message board, side walk sign advertises specials or upcoming events to customers as they are driving by your establishment. With this form of advertising, potential customers can decide at that moment whether or not to venture into your business. 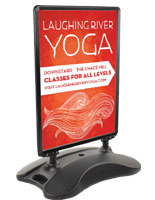 Side walk "point-of-purchase" advertising can be much more effective than multi-media advertising. 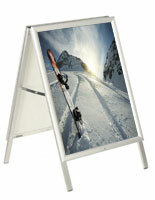 The snap frame side walk sign is designed for a 30" x 40" poster. With a double-sided advertisement this large, the side walk sign is ideal for not only walk-by customers, but also for potential customers driving by. 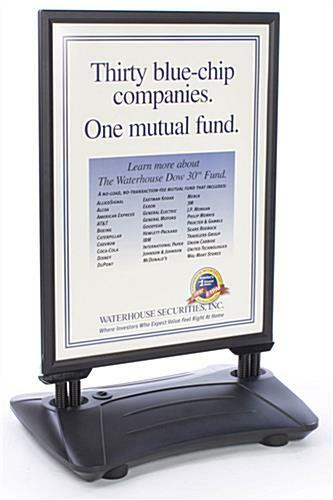 This black-base side walk sign, also known as a message board, has a lot of great features for a user. 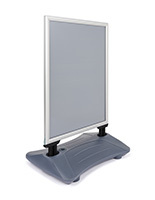 The side walk sign features a double-sided snap open aluminum frame with (2) non-glare lenses. 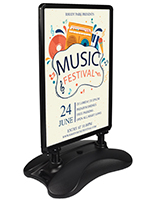 The snap frame allows for quick graphic changes and features rubber gaskets to keep your poster dry in wet weather. Lightweight spring connectors connect the side walk sign frame to its base to help your side walk sign to move with winds, rather than resisting them. The side walk sign base can be filled with approximately 8 gallons of water to ensure it doesn't simply flip over or roll away in heavy winds. The side walk sign is shipped with rock salt in the base, to prevent water from freezing and cracking the base. Wheels and a hidden handle make the side walk sign very portable, even with a heavy, water-filled base. The side walk sign ships unassembled to save on shipping costs. Simple assembly requires only a ratchet or wrench. All other hardware included.